Treat yourself to a cold bottle of Saison! The lightly fragrant Thai ale is specially brewed for us by Hop Kettle Brewery at Cricklade and the artwork is designed by Hunto. Take advantage of this beautiful weather and cool yourself down with this crisp, refreshing beer. 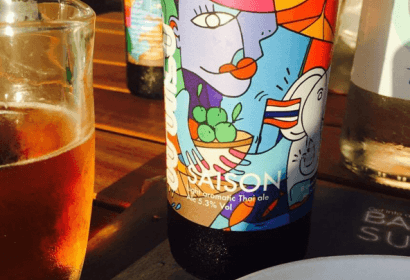 This is the latest edition or fantastic selection of beers and asian inspired cocktails that are the perfect accompaniments to our modern Bangkok cuisine. Discover our full drinks menu here. We also have special offers on drinks as specific Busaba location. Head down to our Hoxton restaurant any day of week between 4pm and 7pm for 2-for-1 cocktails and two 330ml bottles of Chang Beer for only £5. View all our offers here.